This may seem a quaint notion, but sometimes it’s nice to have a movie that is simply affirming and joyous and a celebration of what can be best in the human spirit. That is The Greatest Showman‘s raison d’etre. The subject of PT Barnum‘s now-controversial life may seem an unlikely vehicle for such a film, but that is indeed what we have with Hugh Jackman‘s latest. I absolutely loved this movie. With music by Benj Pasek and Justin Paul, composers of La La Land and the recent Christmas Story Live!, the film will never be accused of being high-art, but then that is not what Barnum‘s stock-in-trade was either. With our present distaste for circuses and with the revisionist history that sees Barnum as less of an inclusive and big-hearted entrepreneur and more of an unethical and selfish opportunist, viewers are best-served to check those preconceptions at the door and approach the film as if Barnum is a mythological figure from American folklore, a la Johnny Appleseed or Paul Bunyan. Barnum (Jackman) chides a theatre critic who has no use for the ringmaster’s brand of populist entertainment, “A theatre critic who can’t find joy in the theatre. Now, who’s a fraud?” It seems to be as much a definition of Barnum’s artistic philosophy as a caution to Twitter trolls in the audience ready to hate on The Greatest Showman‘s gee willkers approach to American cultural history. Helmed by first-time director Michael Gracey (who had a reported assist from Logan‘s James Mangold) and with a screenplay written by Jenny Bicks and Bill Condon (Dreamgirls, Beauty and the Beast), the film offers a cursory look at the significant and recognizable moments in Barnum’s life, like story beats in an oft-told fable … with a heaping helping of Horatio Alger-ism: we Americans can be whoever and whatever we want to be, regardless how checkered our pasts (hell, just look at the White House and Capitol Hill). This is not a detailed, cynical, warts-and-all biopic but rather a heartfelt and inspirational allegory (bordering on the twinkling best of Hallmark Hall-of-Fame‘s legendary output) that material success cannot substitute for authentic love. And that is just fine. Hugh Jackman is totally in his element, throwback as he is to a Hollywood of another era where corny was not only king but was embraced and celebrated by the masses. It is a refreshingly positive (albeit whitewashed) take on a legendary American captain of industry – the kind of story-telling that was prevalent in 1950s Tinseltown technicolor fantasias … or that librarians used to read aloud to us third-graders in our elementary school reading circles. However, The Greatest Showman is smart enough to supercharge the proceedings with a percussive, propulsive, almost martial, contemporary pop score to hook a generation of audiences weaned on High School Musical or Glee. The bones of the story are not dissimilar to those of Barnum!, the 1980 Cy Coleman Broadway stage musical starring Jim Dale and Glenn Close, but the proceedings couldn’t be more fresh or modern. Disney Channel alumni Zendaya and Zac Efron deliver lovely paper doll turns in this 21st century panto-play. Michelle Williams is luminous, simultaneously distant and winsome – arm candy with an iron will – as Barnum‘s stoic wife Charity. The supporting cast is rounded out with a strong team of stage alumni who relish every moment of this big-screen cartoon. Kealla Settle as Lettie Lutz, the “bearded lady,” is one to watch. Her mid-movie barnstormer “This is Me” brings down the house with a can-you-hear-the-people-sing intensity that should leave you exhausted and enraged and damned “woke” … if you have any heart at all. The filmmakers (tom) thumb their noses at depth, knowing that the best celebration of Barnum’s life as a huckster purveyor of humbug would be to deliver free-wheeling holiday escapism that energizes and enthralls. Yet, embedded within the cotton candy fluff is a timely and haunting message of acceptance and understanding and compassion. Sociopolitically, the film does continue the troubling trope of “beautiful white dude as multiculti savior.” However, it marries that message to a final act comeuppance for Barnum. Per the film, Barnum’s fatal flaw is always looking past the talent in his midst to see who else might be coming through the door, breaking the most important of hearts in his unyielding aspiration for validation from an American elite that continually rejects his kind. After a final act tragedy, Barnum’s family of freaks confronts him with this brutal truth, licking their wounds, rallying the troupe, and reminding us all that the greatest show exists with those who’ve been loyal to us all along. 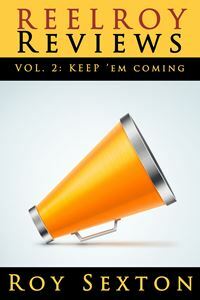 Reel Roy Reviews is now TWO books! You can purchase your copies by clicking here (print and digital). In addition to online ordering at Amazon or from the publisher Open Books, the first book is currently is being carried by Bookbound, Common Language Bookstore, and Crazy Wisdom Bookstore and Tea Room in Ann Arbor, Michigan and by Green Brain Comics in Dearborn, Michigan. My mom Susie Duncan Sexton’s Secrets of an Old Typewriter series is also available on Amazon and at Bookbound and Common Language.